Peanut Butter Cups will keep for 1 week in an airtight box in a cool place. 1. Line the mini-muffin tin with cases. 2. Start by preparing the peanutbutter filling. Tip the white chocolate into a small heatproof bowl and melt either in 10-second blasts in the microwave on a low setting or over a pan of barely simmering water, making sure the bottom of the bowl doesn’t touch the water. Remove from the heat, stir until smooth and add the peanut butter and vanilla extract. Mix to combine and set aside. 3. Place the milk and dark chocolate in a heatproof bowl and melt over a pan of barely simmering water, stirring frequently until silky smooth. Remove from the heat and cool slightly. Spoon 1 teaspoon of the melted chocolate into each paper case, then spoon roughly 1 level teaspoon of the peanut butter and white chocolate mixture into each cup, flattening the mixture slightly with the back of the spoon. Cover the peanut butter with another teaspoon of melted chocolate and tap the tin gently on the work surface, so that the chocolate covers the peanut butter in a smooth layer. 4. 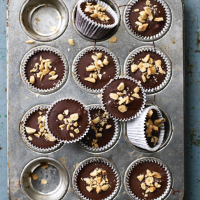 Scatter the peanuts over the top of each chocolate cup and leave in a cool spot until completely firm before serving.